The little blue guy above is quick and easy to make, and will fit perfectly into the pocket of this pillow. Otherwise, he does just fine on his own, thank you! Wash and dry all fabric. Iron if you need to. All seam allowances 1/4" unless otherwise noted. STEP 1: Print out pattern using this link (see photo 1). STEP 2: Cut out all the pieces on the solid line (see photo 2). STEP 3: Trace around each template onto wrong side of fabric. 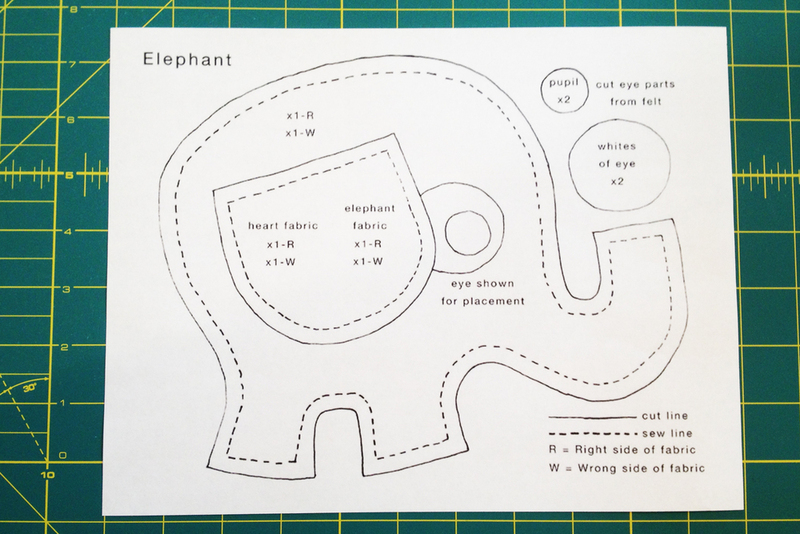 The number of pieces needed is indicated on template (elephant template should be traced twice, once on the wrong side of the fabric and once on the right side of the fabric). Notice how the ear pieces cut from elephant fabric contain elephants centered within the space. Also notice how the pattern is upside down. On finished piece, this will allow for a happy game of peek-a-boo! Cut out the pieces (see photo 3). STEP 4: Pin white felt into position and sew around the circle using blanket stitch. Repeat with the black felt. Sew right sides of ear pieces together leaving straight edges open. Trim with pinking shears along the seams. (See photo 4). STEP 5: Turn ears right side out and press. Tuck raw edges in .25" (See photo 5). 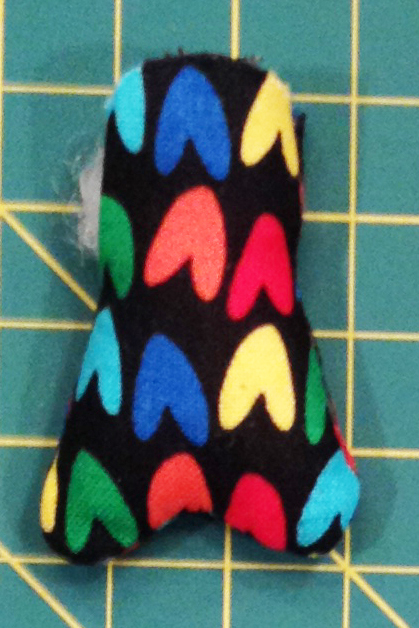 STEP 6: With heart sides up, pin ears onto elephant pieces as shown (see photo 6). Using a straight seam, sew just along the top edge to attach. STEP 7: Pin tail on one side of elephant as shown (photo 7). 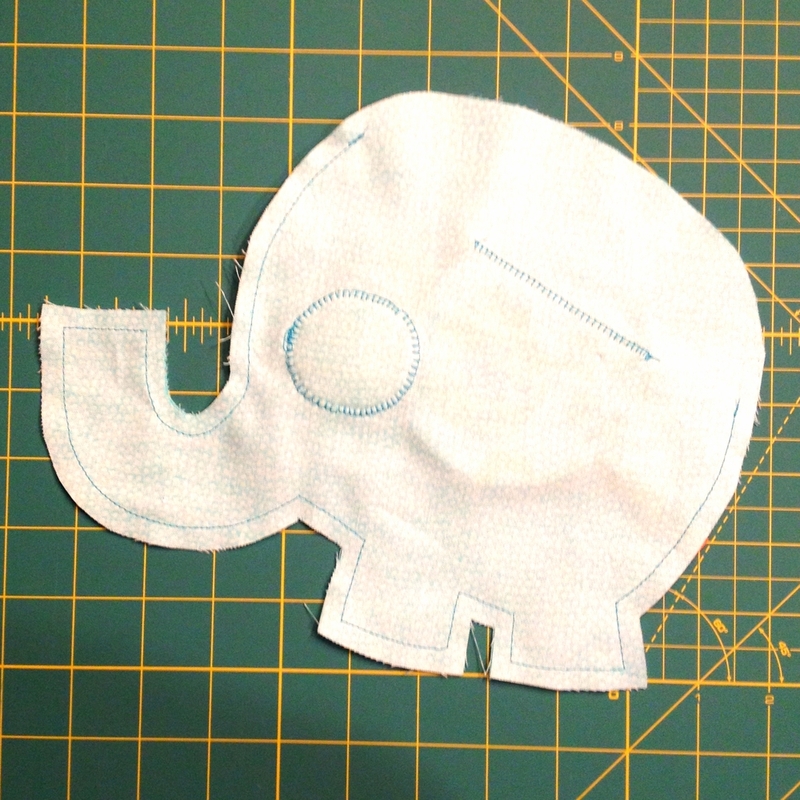 STEP 8: Pin right sides of elephant together taking care keep tail safe from seams. 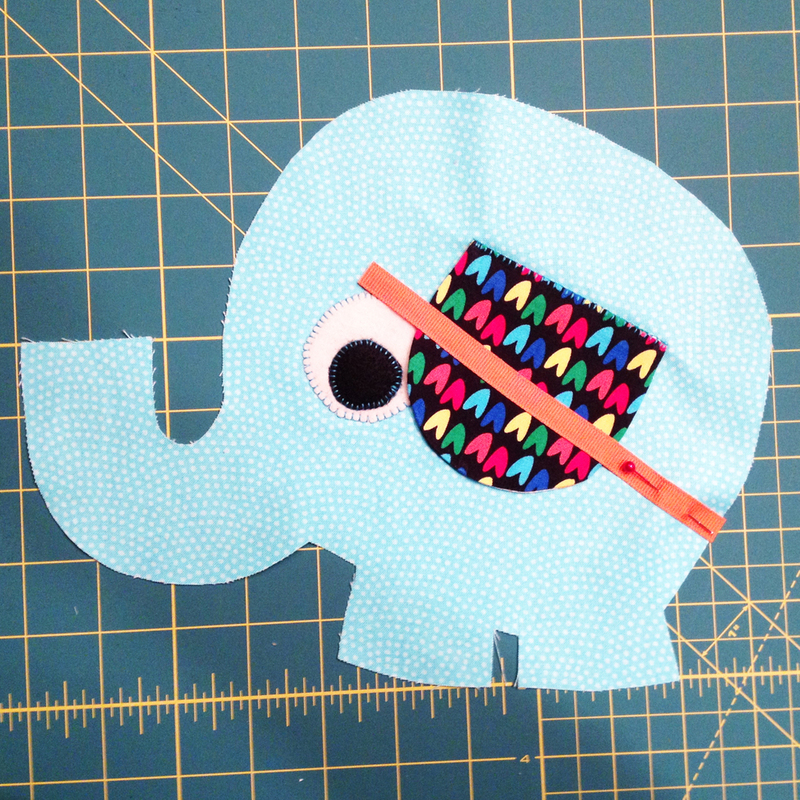 Using a straight stitch, sew around the perimeter of the elephant leaving top side open as shown. (photo 8). STEP 9: With pinking shears, trim excess fabric from seams. Snip curves and corners to prevent puckering. (See photo 9). Turn right side out, then push out corners using a capped pen, skewer, or any other long, straight, skinny object you might have. STEP 10: Stuff body with fiberfill, starting with trunk and legs. To close the opening, fold raw edges under .25", pin together, and sew closed using slipstitch. Done! Hope you enjoyed this tutorial. If you think of it, please send a photo of your little guy, I'd love to see it! 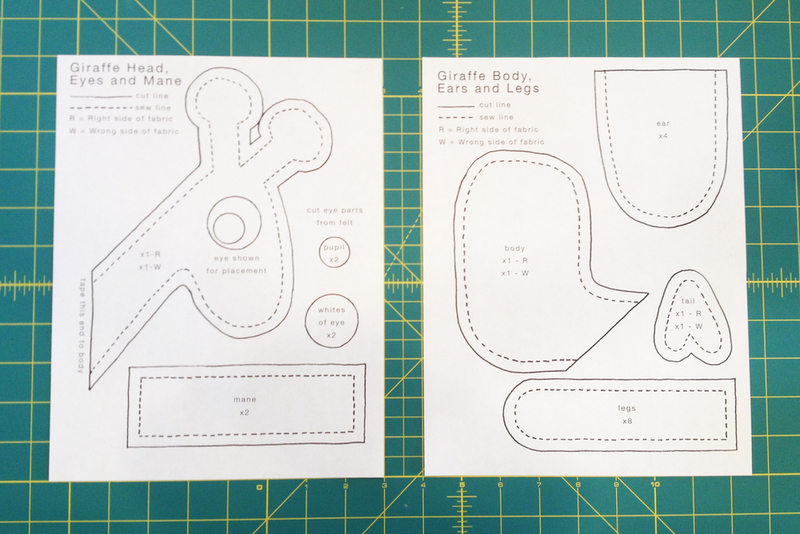 In this tutorial, I'll be guiding you through the steps to make a swell little stuffed giraffe. Funny, when I finished designing and constructing this little guy, I wasn't sure how lovable he'd come off to the youngens. But when my 7 year old daughter saw him she immediately latched on and hasn't let go since! Poor Squishy the octopus (her lovey for the past 6 months or so) has been dropped, literally, and forgotten. Eight fuzzy arms gather dust on the floor of her bedroom as I write this. So at least we know that your time spent bringing giraffey to life won't be a wasted chunk of your day. 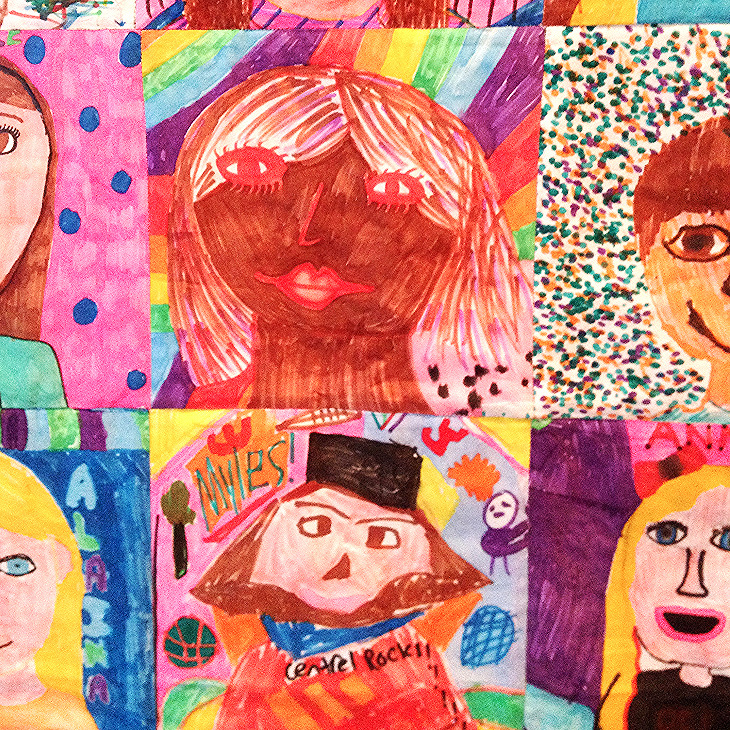 You'll be creating a lovable friend for the "Little Me" in your life. STEP 1: If you haven't already, print out the template in the supplies list (see photo 1). STEP 3: Tape the giraffe head to the body (see photo 3). STEP 4: Trace around each template onto wrong side of fabric. 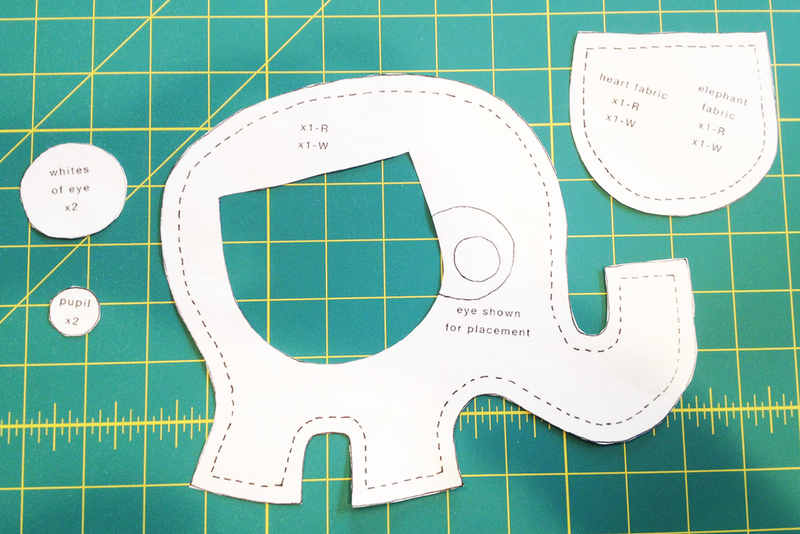 The number of pieces needed is indicated on template (giraffe body/head template should be traced twice, once on the wrong side of the fabric and once on the right side of the fabric). Cut out the pieces (see photos 4a and 4b). STEP 5: Pin white felt into position and sew around the circle using blanket stitch. Repeat with the black felt. (See photo 5). STEP 6: Sew right sides of ear pieces together leaving straight edges open. Turn ears right side out and press. Fold and pin bottom accordion style on each side so that folds meet in the middle (see photo 6a). Sew along bottom edge to secure folds (see photo 6b). STEP 7: Sew right sides of leg pieces together leaving straight edges open. Turn legs right side out and stuff with fiberfill. 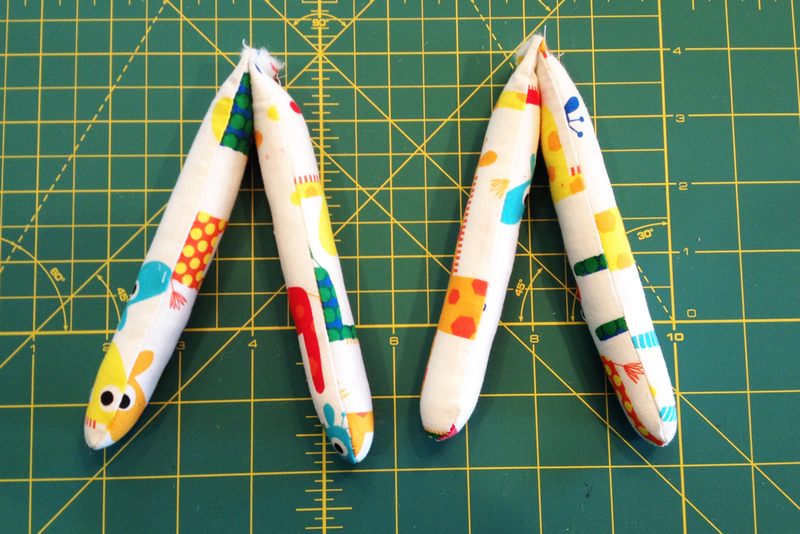 Pair legs and sew along straight edges to connect (see photo 7). STEP 8: Sew right sides of tail pieces together, leaving top open. Turn right side out and stuff with fiberfill (see photo 8a). Tuck raw edges in .25", insert ribbon .5", pin and sew closed using slipstitch (see photo 8b). STEP 9: Fold mane piece in half lengthwise with right sides together. Sew around two sides, leaving one small side open (see photo 9a). Turn right side out. Sew seam .25" in from the long side with existing seam. Stuff with fiberfill (see photo 9b). Tuck raw edges in .25" and sew closed using slipstitch. STEP 10: Place main body pieces together with right sides out. Start at the mouth and work your way around the back of the head, folding raw edges under .25" and pinning edges together. Pin ears and mane in place between the two layers of fabric as shown. Sew around the perimeter until you reach the bottom of the mane. Stop and stuff the horns (technically ossicones) while you can still reach them easily. Pin remaining edges together with tail and legs in place between the two layers of fabric as shown. Remember to fold raw edges under .25" as you go. Sew around the perimeter from where you left off until you are past the legs, leaving front seam open (see photo 10). Stuff the body, pin remaining edges together, and sew closed. And don't forget to make giraffe or elephant to go along with it! I've been playing around with vector art! Lots of fun...after scanning drawings from my sketchbook, I use Image Trace in Illustrator. At that point I can individually select and colorize the lines, fills, and background. Also, easy to play with color schemes. In Kuler I create color palettes by pulling from photos or artwork. The palettes automatically load into Illustrator where I can pick and choose. The colors in the floral were not as tacky looking when I was working on it, I swear! They were mellow and muted, so just try to picture it, please. A couple pages from my sketchbook cleaned up in Illustrator. 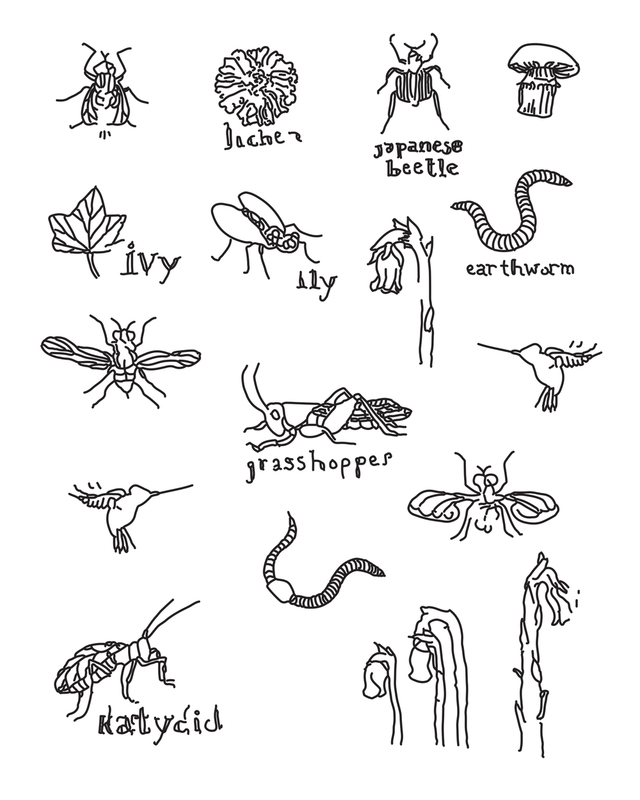 The first sketch is part of an ABC project I have been playing with which I call "Small Wonders". The second sketch of dreidels and menorahs I'd like to work into a repeat for Chanukah gift wrap. The idea here is from a story I wrote some years back called "Night Bird". It's about a bird that visits a boy's window every night until he agrees to fly with him. However, the bird is not your typical nocturnal, which is meant to give it's visits a little air of mystery... Below are two different pattern designs I worked on this week with the Night Bird in mind. Something irked me about the pointed stars in the first, so I redid it with rounds stars. The last is a work in progress. 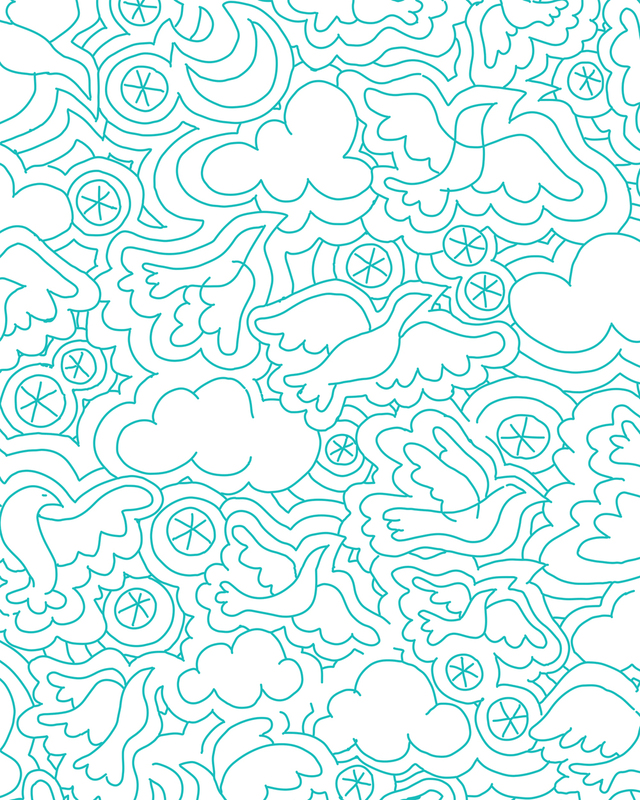 Next week I'd like to develop several more designs to create a collection around the Night Bird theme. Natural product packaging I noticed and liked while food shopping at Fairway. I've used the blanket stitch on my machine before, but this is my first time trying it by hand. Can you tell? I like the back, pure color. Too bad it will never be seen once it's hanging on the wall!